Over the years I’ve become obsessed with understanding prospects and customers really deeply. There are bigger sins, I suppose. “Understanding your audience” is critical to driving effective marketing and sales but is a vague topic. What does it really mean, exactly? Last week I gave two speeches on that topic in talk called “Building a Data-Driven Marketing and Sales Machine,” an area of focus for Boundless Markets. I cited a Bain study which found that companies who excel in their use of analytics are twice as likely to financially outperform their competitors—and 5X likely to make effective decisions. I also mentioned 1) fourteen different kinds of analytics, 2) some insights that can be gained from each one and 3) how we helped one of our clients achieve double digit revenue growth in two months by leveraging such data. Web analytics. What are your prospects searching for and how does that vary based on audience segment? What content makes them come back again and again to your web site and convert? Which pages of your site are most likely to attract visitors…and which pages turn them away? Third party data. What do your prospects and customers read, what do they purchase and from whom do the buy? Intent data. Which prospects are in the market to buy right now? And what content are they reading? Predictive analytics. What messages and content are likely to move the customer further down the purchase cycle and how does that vary by customer segment? Multivariate and A/B testing data. What messages, design and offers resonate most and drive results? Social media analytics. What your customers and prospects are they saying about your company, brands and products? What are their concerns, likes and dislikes? Who are the top influencers shaping opinions in your market? Attitudinal/survey data. How do customers feel about your products? How likely are they to consider or purchase and which levers can better motivate them? Best customer modeling. Which prospects have similar characteristics as your best customers? IP resolution data. What companies visited your web site today and earlier this week? And where are the people in those companies located? How does this stack up against your target accounts and VIP customers? Call tracking data. What times of the day and the week should you staff up your sales reps? What companies called your company in the off hours but did not leave a message? Semantic phone call analytics. Which sales calls with prospects were missed opportunities that could have resulted in a sale? Call center analytics. What is the optimal number of times a sales rep should try calling a prospect before moving on to another one? How many calls are not enough – and how many are too much? CRM analytics. Where exactly in the sales process are you losing prospects? How much revenue is in the pipeline now? Which sales reps are most successful at converting prospects into sales? Conversations with customers. Pretty much anything else…and a darn good starting point. All of the above can be known if you have the right tools, resources and processes — what I call “data discipline.” We’re pleased to offer a FREE data assessment tool that can help you understand the “data discipline” of your marketing. This helpful tool is something you can use yourself or share with others in your company. And yes, there is a grade at the end. Check it out. It’s on us. We’re pleased to offer a FREE data assessment tool that can help you find out how much “data discipline” your marketing organization has in key areas such as customer and market insights, measuring marketing performance and improving processes. This helpful tool is something you can use yourself or share with others in your company. My advisors told me not to use the subject line of this post. They said I should not suggest that our readers don’t know their business. Of course you do. Our readers tend to be extremely smart, intellectually curious and great at what they do. So why am I asking about things you don’t know? It’s to make that point that, no matter how much you know, there are often important gaps in knowledge that, if addressed, can help make much smarter decisions. You’ll never have 100% of the data and striving for that would just slow you down unnecessarily. I’m not talking about “nice to know” facts; I am referring to insights that can inform big choices and drive excellent execution. We recommend a systematic way of identifying and learning what you should know but don’t—about your market, your competitors, your customers, your opportunities and your marketing and sales performance. By now you probably know that Boundless Markets conducts data audits, a structured process that identifies data and knowledge gaps for clients, and then fill those gaps (with new data sources, analytics and modeling, new technologies/tools, user videos, customer listening studies and quantitative market research). Whether you do these things on your own or work with us, we advise starting by taking stock of your company or team’s data discipline. This is NOT about boiling the ocean with data collection. It IS about thinking critically about how data and analytics can help drive your business. Does your company and team have data discipline? Here are three key ways to find out. These are things to ask yourself and your team. Do you have a list of data and knowledge gaps? Gaps represent key pieces of information that are missing in planning and/or execution. They’ve been proactively identified by you and your team as “important things we need to learn.” These gaps can be found in the upfront strategy setting and at all stages of execution. It is wise to think broadly about data and knowledge gaps. Why are some of your competitors winning some of your business? How do your target prospects perceive your company vs. your competitors? What are the leading indicators of your customer acquisition? Which of your customer prospects are in the market to buy right now? Which non-intuitive things do your best customers have in common? How often do your target prospects visit your web site? What do people in your market think of our web site? How does it make them feel? In your lead generation do you know exactly where you are losing prospects in the marketing and sales funnel, and the revenue you’re leaving on the table as a result? How many sales calls does it take to close a sale on average? Which of your customers have the greatest risk of leaving? Who has contributed to your list of data and knowledge gaps? It’s important that employees with related goals get on the same page about the knowledge gaps that exist, or have a process to get there. For example, Sales and Marketing need to be aligned, because customer knowledge and analytics are the fuel that drives results, and data is the glue that connects sales and marketing. Recently we spoke with a marketing director who did not know the sales conversion of the leads he was generating. Without that knowledge there’s no way to determine revenue per lead and the number of leads required to optimize the customer acquisition process. What’s worse is that, with a little bit of work, the data was readily available. Are your gaps prioritized, with a plan in place to address them and take action? A big part of the planning process should be the action you’ll take once you find out the answers. Intended actions – what you’ll do (or could do) if you have the data – should drive the process. This helps the prioritization. Determining intended actions is best done in a group setting, since it really is a collaborative effort, and the process helps increase alignment. The perceived ease of filling knowledge gaps also affects priorities. Often it is assumed that things are not easily knowable. Data often exists in silos or is not “in shape” to be actionable. Yet solutions are now available to address these issues and gain important insights. And they are more robust and affordable than you may think. Other times, third party data or analysis is required but the options – or the best way to proceed – are not resolved. And this can result in a sort of decision purgatory….where issues linger eternally. The bottom line: it helps to proactively find out what your company or team does not know but should. Inject that discipline into your planning and execution. Then make sure you and your team are armed with intelligence to make more informed decisions. To make this happen, pointed questions need to be asked and obstacles that get in the way of actionable insights need to be addressed. 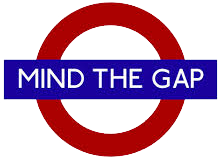 When it comes to business intelligence, it’s best to remember the signs in the British Tube: Mind the Gap. Because information as usual leads to business as usual, and the status quo is often a dangerous place to be in competitive markets. How many of you put major resources into driving potential leads to your web site? Do you know what your audience thinks of your web site? To the first question, almost all the questions went up since web sites are the hub of marketing activity. To the second question, actually asking users what they think of their company’s site, very few hands went up. It was good validation for one of the services from Boundless Markets called User Insights. And I’d like you to know about it. User Insights reveals what actual users think of your web site and messaging. We recruit users who participate in quick immersion studies and give them specific tasks to perform on a client’s site (which are based on their unique goals), and then ask them pointed questions. Sessions are recorded via video and audio, AND every movement of the mouse is captured for clients to see. So clients know what happened on their site, how the experience is perceived and why. One of our clients, a telemedicine provider, learned that many visitors viewed the company as a health insurance provider; their virtual health care benefit was getting lost. Our user videos and recommendations helped increase their sales conversions by 18%. We also help clients with advanced web analytics, but analytics tells what happened on a web site, not why it happened. User Insights goes deeper. By understanding motivations, perceptions and attitudes, you can learn much more than simply viewing a dashboard full of numbers. You can also see and hear what users notice, don’t notice, what they like and what they don’t—in the words of actual users. Videos are professionally edited, made ready for the boardroom, and accompanied with full transcriptions and detailed recommendations for improvement (from a team that has run digital businesses generating nearly $500 million). Check out the video overview here. If you know someone who can benefit from User Insights, drop us a line or give us a call at 917-373-7451. The service can also be used to learn what users think of your competitors’ sites vs. your own. We are currently forming partnerships with other companies that have complimentary services. And getting back to the topic of the panel, the lesson of User Insights is to learn more by keeping it simple. Got questions? Ask your audience. In the creative world of sales and marketing, “process” often gets a bad rap. It can imply an over engineered, bureaucratic method that lacks inspiration. Should you have a CMO or head of sales who is a process person? Or a strategic leader who guides and motivates the team? The latter is what’s usually required of leaders. But don’t you wish you had a nickel for every strategic visionary who doesn’t know how to execute (or hire strong executors)? Well conceived processes can make the difference between mediocre results and spectacular results. 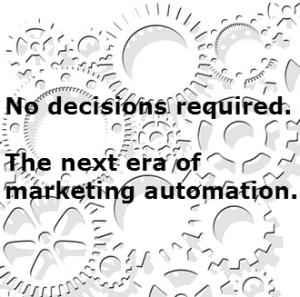 They help create well oiled sales and marketing machines. There is no one “right” process that applies to every company. It is highly situational. But to illustrate, here are some new processes we put in place for a client whose business is a mix of e-commerce and enterprise sales. Revenue is up 54% YTD vs. last year. Sales representatives and customer service staff and are notified in advance and made aware of the campaign theme and the messaging. Products and services related to the theme are merchandised more heavily on the web site to kick off the sprint. A topical video is created and promoted through multiple channels. At least one sales representative provides feedback when the video is created. Multiple channels are used to drive web traffic with messaging that relates to the campaign and reinforces the overall brand. In advance, the team thinks through how to re-engage the audience with re-marketing and CRM targeting. Past buyers and win-back candidates are sent a series of targeted emails with content on the same theme, along with new prospects who are treated somewhat differently based on our segmentation. Sales representatives send personalized and slightly different versions of the email to their VIP customers, including a link to the latest video. The outside telesales team uses the timely topic to create a sense of urgency with prospects and then segways into the main pitch. Customers who purchase on this topic are flagged as such in the database, so we know their interests and what drives their responses. Customers who buy through e-commerce are contacted and targeted with up-sells and higher-end services by sales representatives. Rinse and repeat. Unless a better process is developed, since processes can and should improve over time. We have built other processes to improve quantitative rigor and get feedback directly from customers. Each player on the team knows their roles and what’s expected. When done cross functionally, they create team wins and foster a team culture. Best of all, they allow an organization to have a repeatable and scalable playbook —and that’s the hallmark of well oiled sales and marketing machines. The trick is to stay fresh and encourage innovation in ways that reinforce the overall strategy. So the next time you’re in the board room, consider this: “process” shouldn’t be a dirty word. This post is adapted from my article which originally published in Chief Executive before last year’s Super Bowl. The observations still apply, particularly since the organization mentioned in here has not changed practices. The Super Bowl is almost here, and with it, the media scrutiny of thousands of journalists who cover the event. 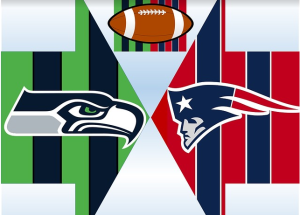 All eyes are on the Patriots and Seahawks, and their eyes are on each other—preparing strategies, refining playbooks (and checking the inflation on those footballs). For retailers, that moment is Black Friday. This day the kicks off the holiday season which generates about 1/3 of annual revenue in the retail business. On this past Black Friday, I went to a local Staples store to buy a few items. Simple enough? No. The customer experience was horrible. An inexperienced cashier fumbled the handling of my rebate check, had a poor attitude and with 4-5 other errors the entire experience – which should have taken one minute – took twenty five and left me feeling cold. This particular Staples store blew their Super Bowl Moment. Hopefully this store was a atypical for the chain. With nearly 1,900 locations in North America, Staples generates an estimated $1.5 billion in revenue on Black Friday weekend. If only a tiny fraction of their customers had equally poor experience as me, the impact on their business would be significant. It begs the question: what are your company’s Super Bowl moments and how can you prepare? Define the levers that drive your customer experience, quantify the impact of each lever on sales and then improve them accordingly. Particularly in planning for Big Game Day. How can plans for Super Bowl moments be operationalized—and be part of your knitting every day (for your regular season). There’s no excuse for poor performances during Super Bowl moments. With proper planning and excellent execution, every day can be a big game victory. Great entrepreneurs move quickly and make bold decisions. Les Wexner personifies bold decision making. He’s a retailing legend and the current longest-serving CEO of a FORTUNE 500 company. He started the Limited in 1963 with a $5000 loan from his aunt and grew that investment into a $12 billion company whose brands include Victoria’s Secret, Bath & Body Works, Henri Bendel and others. Mr. Wexner talked about how jumping on opportunities can pay off in spades. I read The Wall Street Journal on a Friday about Lane Bryant going private…called them the same day about a possible acquisition. They said ‘no’ because their board meeting was on Monday. So on Saturday I got a loan for $125MM and we closed the acquisition of Lane Bryant on Monday. We paid off the debt in 120 days. A sense of urgency doesn’t always mean fast, game changing decisions. It can come from long term strategies that cultivate broad scale change motivated by a healthy sense of paranoia. You’ve got to innovate faster than the disruptive companies can commoditize you. There’s where partnerships come in. At Dow, we lead and join associations that are at the center of change. We foster innovation hubs in partnership with federal and state governments and universities. They take time but we gain a research edge… one result is the development of ‘smart paint’ that can absorb emissions. In the future we’ll have paint that can absorb viruses. We get criticized for investing in R&D to create future earnings…things like self healing materials and smart batteries. Everything (on Wall Street) is so short term focused. We partner with entrepreneurs and learn from them. We’re inspired by entrepreneurs who seek out and spot emerging trends and then jump on them with extreme focus. As we’ve written before, innovation doesn’t have to imply a lack of quantification. The leaders of Omnicom and Dow Chemical, for example, are quick to point out the measurement they’ve put on innovation efforts. $250MM in revenue has been created from ideas that came from bringing together very diverse groups of people— solving challenges for customers. One KPI we use: the % of margin coming from new product launches. But beyond measuring the results of innovation, the innovation process itself can, in part, be driven by the numbers. Here are some examples. INSPIRATION AND RESULTS, FROM A TEAM WITH A FINANCIAL STAKE IN YOUR SUCCESS. By now, you probably know that Boundless Markets accelerates revenue growth for clients by increasing their marketing and business development capabilities. But you may not know that we also accelerate innovation, though a proprietary framework and exercises that have helped generate millions in revenue for clients and past employers. These proven processes (and our love of upside) are one reason we often take a percentage of the revenue we generate for clients. Eat your own dog food. That’s a blunt way of saying a company should practice what it preaches. In other words, a company whose entire existence is based on helping companies improve the targeting and relevancy of marketing to audiences completely ignored these principles in their own follow-up. The way these mistakes happen, even with the best automation on the planet, is typically with human error. Their representative tagged me as the wrong kind of prospect, and as a result the only automation that happened was one of irrelevancy. 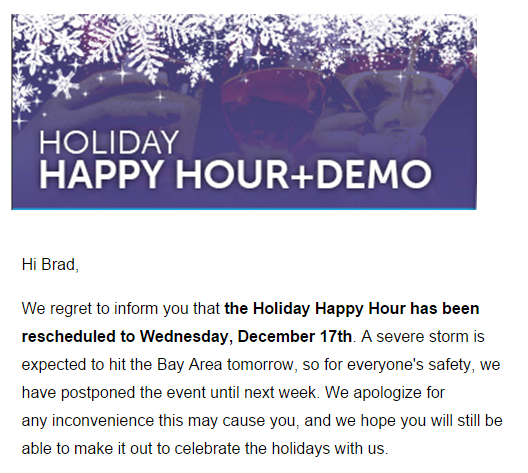 A few weeks later, the same company sent me the email below— a note about their holiday party in the Bay Area – and they know I’m based in New York City. How do they know where I’m based? Well, they asked during the initial phone call. 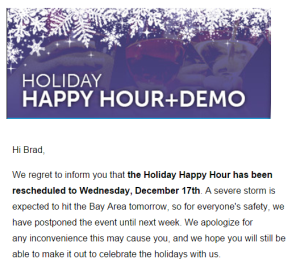 But either my address didn’t make it into their system or their holiday note did not take geography into consideration. Either way, score one for data collection, score zero for acting on that data with smart targeting, which is what their entire company presumably is all about. It is clear that this leading provider of marketing automation, a recognized “thought leader,” does not eat its own dog food. No wonder the speculation inside the industry is that this company does NOT even use its own software to automate their internal marketing processes. Great companies internalize and perfect the practices they trumpet—this is a powerful part of effective branding. Doing anything less can destroy a company’s credibility. Can you imagine what it takes to turn around the impression that your company does anything less than excel in areas core to your value proposition? Take a minute to answer the following questions to see how well your company eats….err, practices what you preach. What values are inherent in the way my company and products are positioned, and how well does your customer experience reflect them? Are there well articulated, desired behaviors for employees that tie to these values? How is ownership for these behaviors assigned and are proper accountabilities in place? Do you have metrics/KPIs for these desired behaviors? If your answer is no to any of those questions, what do you plan to do to remedy the situation? As you ponder that question, consider this quote from Shakespeare: “It is a good divine that follows his own instructions”.